This past Sunday, I spent most of the day recuperating from the maniac pace of the preceding week. Some of this process involved watching football (yes, I am getting adjusted to the fact that it’s now a part of my life) and enjoying a beer. The problem with this scenario is that I was lacking the proper nourishment that such a day requires. I had in my refrigerator sweetbreads that I had removed from the freezer the night before. (Don’t know what sweetbreads are? Mwahaha…Check it out.) 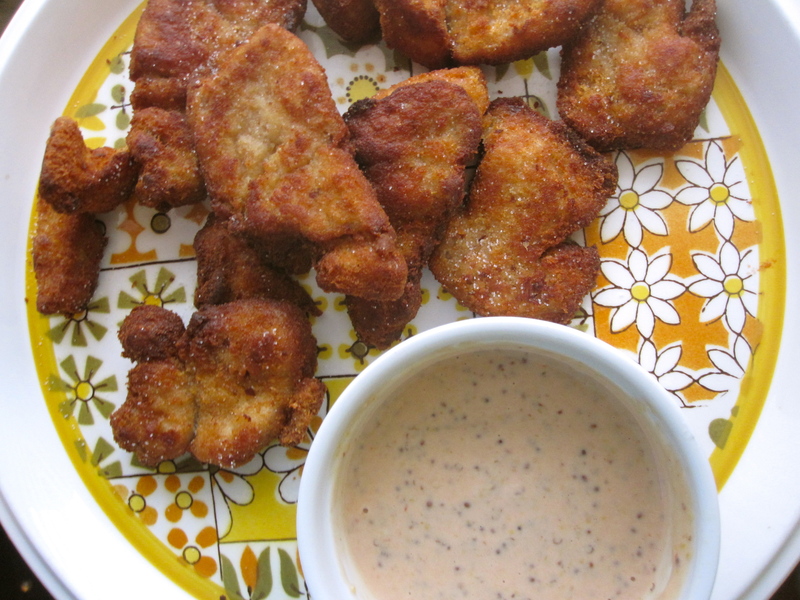 I ditched my original sweetbread plans without looking back and headed in the opposite direction: sweetbread nuggets. It had been years since I’d dunked a chicken nugget into my childhood invention, kusto–a blend of ketchup, mustard and mayo. I figured sweetbreads’ mild, sweet (get it?) flavor would be a great (and totally unnecessary) swap for chicken. You know I ate these in my underwear and a big, oversize t-shirt. And I ate all of ’em. Mmmm. I actually love sweetbreads and this a brilliant plan for them and i’m going to have to try it. They also are very tasty as breaded, fried cutlets on a sandwich.